Country Wedding Under a Great Old Tree. Highland Manor, is located in the country town of Apopka. The town itself is nestled in the hills of Central Florida within striking distance of Orlando, Florida and the many attractions that the area has to offer such as Walt Disney World, Universal Studios and SeaWorld. Featured at the venue are majestic Oak and Cypress trees draped with Spanish Moss and an historic home with plenty of space to hold large parties for events ranging from business meetings to weddings. It was to this majestic spot that Scott and Amanda brought their family and friends to help in celebrating their marriage festivities. 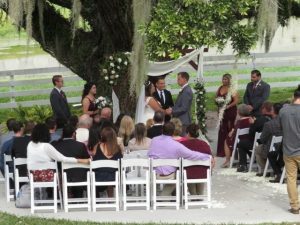 Lon Tosi of Celebration Florida and from the Orlando team of Sensational Ceremonies worked with the couple for many months to create just the prefect ceremony that very much centered around their deep love for one another and their close relationship with family and friends. Everything was captured by Joe Marolis the Owner of Elegant Entertainment our to Orlando. Elegant Entertainment provided the sound system for both the ceremony and the reception afterwards along with some amazing entertainment! It was a gorgeous event with wonderful Central Florida weather and all was captured in photos by The Thiemans – Toni and Carlton! Dubsdread Catering made certain that the food was amazing. It was a prefect evening on all accounts. Congratulations to Amanda and Scott!